German forces are shown in red, and are generally on the left of the map. Soviet forces are shown in dark blue, and are generally on the right of the map. 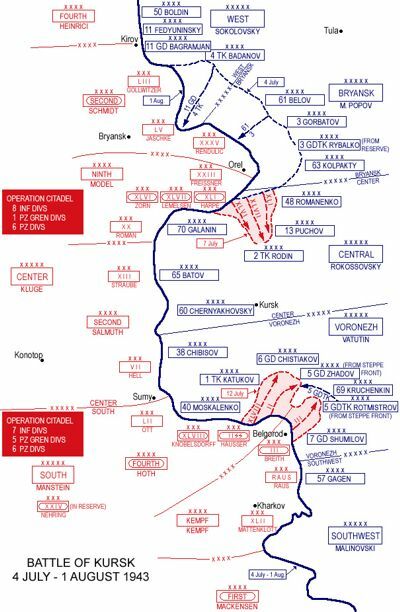 From the map, you should be able to see the Northern prong of the assault, using units from Army Group Center, attacking the Northern part of the neck of the Kursk salient, and likewise, the Southern prong, using units from Army Group South, attacking the Southern part of the neck of the salient. You should can also see the Soviet counteroffensive to the North of the Kursk salient, which in August pushed the Germans back from the dotted blue line back to the solid blue line.